Before email, text or snapchat, there was one way to communicate that was even cooler, though much less reliable: sending a message out to sea in a bottle. Countless stories have been shared of bottles that were sent out to test drift currents, to share pleas for help from shipwrecked sailors, or just to see how far the message could travel. Here’s one particular story that is worth the share. 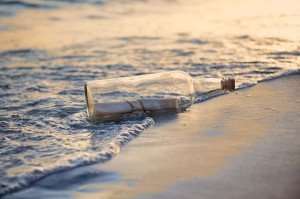 In 1956 a Swedish sailor named Ake Viking (yes, that’s really his name) decided to send a message in a bottle. He didn’t just send out any message though; his was a plea for love. He started his message: “To someone beautiful and far away” – and then asked whoever found the message to write back to him. Nearly two years later in Sicily, a woman named Paolina found the bottle and responded to his message. She wrote: “I am not beautiful, but it seems miraculous that this little bottle should have traveled so far and long to reach me that I must send an answer.” The next part of the story is the best part. They continued corresponding… and eventually ended up marrying. It all sounds too great to be true, and yet it is. One simple outreach for human connection in the most impossible way led to love. Our favorite part of the story isn’t that Paolina found the message but that she wrote back and they continued corresponding. That’s how true connections are made, through contact. It’s something that I believe in and that’s why I use SendOutCards. Next time you feel the need to reach out to someone, try a method a little more efficient than a message in a bottle – a heartfelt card. Keep up the correspondence. It’s the perfect way to show love and affection simply and easily. Who knows what may come of it!